The RSS, which provides the ideological grounding of Hindu nationalism, as well as a significant section of the ground game, has forced Jaswant Singh out for the simple act of praising the founder of Pakistan. They’ve warned all other moderates to basically shut up and toe the party line. No one seems to remember that the BJP became nationally popular thanks to a pragmatic program of economic growth, reducing corruption, and downplaying Hindutva. Again, the moderates in the party are bemoaning these trends, and warn that divisive communalism may lead to short term electoral gain, but will ultimately lead to total marginalization. No one is listening. A little bit of morning music Monday for your listening pleasure to lull you out of Thanksgiving/Eid stupor (h/t rockistani). Music courtesy of the band Fair and Kind. Who is this dreamy music that we’re listening to? During summer 2008, Arthi Meera went on a national tour as singer and keyboardist with the band 1997 (Victory Records). During an 11-week tour, Arthi and the band did 35 shows in 24 states, spanning the continental United States from Washington to California to Florida to New York. Okay, Who Burned the Turkey? Update: I’m watching the news, right now. Fox 5 DC is reporting that Michaele was never a Redskins Cheerleader. The Secret Service visited the couple’s winery this morning, but the party-crashers were not there. The Salahis DID meet Obama via a receiving line, Tuesday night. The Secret Service owned their failure in a strongly-worded statement today; the news said that they are considering pressing charges. Before it occurred, the State Dinner was all anyone could talk about, here in Washington, D.C. After? We’re still talking about it– and yes, contrary to what some SM commenters think, State Dinners are a big deal. I will admit that my perception is perhaps tainted; I don’t just live inside the Beltway, no, I am surrounded by the chattering class and bold-faced names because I live in Georgetown, home to many elected officials, the journalists who cover them, and the staffers who serve them. So here? The State Dinner Mattered, with a majuscule “M”. …the Obamas shook things up by serving, among other dishes, Indian food to an Indian delegation, typically a no-no. It wasn’t just American food, it was a personal statement by the first African-American president. They may have started with “elite” arugula, but they also served collard greens. Who better to strike such a delicate balance, and to take a considerable risk, than a world-class chef with a seriously cross-cultural back story? …her bosses at Infosys’s Fremont ,Calif. office mocked her for observing American holidays like Thanksgiving and Christmas and refused to pay her overtime according to California law. Infosys management routinely disparaged Americans, including Mrs. Awasthi, as not having “family values,” and stated that layoffs in America are good because the jobs will be outsourced. Infosys management ridiculed Mrs. Awasthi for celebrating the American holiday of Thanksgiving, telling her that she should not celebrate Thanksgiving because she is Indian, and that therefore she must work on Thanksgiving Day. Eid Mubarak, Mutineers! There are two Eids that Muslims celebrate, one marks the end to a month of fasting and another marks the end to pilgrimage to Mecca, called Hajj. Today we celebrate the latter one, Eid-al-Adha. This Eid in particular is the one where a sacrifice is supposed to be made of a goat or cow (the meat is to be eaten later and donated), in remembrance of the story of Ibrahim being asked by Allah to sacrifice his son and his son being replaced by a goat. It was for this reason, my friends and I joked around about how we needed an Eid goat. Easter has the bunny rabbit, Christmas has Santa Claus. But growing up as a Muslim kid in the U.S., we didn’t really have anything equivalent. I was always told Eid was my version of Christmas, but then, why did all the other kids get presents and we didn’t? 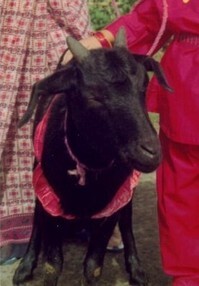 As we got older, it seemed like the Eid goat would have been the perfect solution. Thus, I had already goats on my mind when maitri tweeted the following “I Want a Goat” video [NSFW]. It’s promoting a program, I Want a Goat, where you can design and donate a goat to a village in India. The modern twist is that this video has hipster charm splashed all over it. I realize the tie between this video and Eid is tenuous at best. I found the the song amusing and the cause seems legit. The project was started by a woman Debbie who volunteered in the village for seven months and saw a similar program run successfully in India. For only a $20 donation, you will be donating a goat to a village in Koraput. Why goat? We are now less than twelve months away from the next big election, the 2010 Midterm Elections. Another election? I know, I know. It feels a little too soon. But on November 2, 2010 elections will be held for at least 36 of the 100 seats for US Senate, all 435 seats for the US House of Representative, and a Governor’s race in 36 states. This election is particularly significant because there are six South Asian candidates running for a seat in US Congress. To give a little context, the first person of Indian origin to hold a congressional seat was Dalip Singh Saund (D-CA) who served representing California from 1953-1967. the next one didn’t get elected until almost 50 years later. It was Bobby Jindal (R-LA), who served from 2004 – 2007, after which he got elected as Governor for Louisiana. Here’s the congressional candidate run through: Raj Goyle (D-KS), Manan Trivedi, (D- PA), Ami Bera (D-CA), Ravi Sangisetty (D-LA), Reshma Sejauni (D- NY) and Surya Yalamanchili (I-OH). And they are all YOUNG, ranging in age from 27 to 40 yrs old. Physician and former chief medical officer of Sacramento County’s Primary Health Care system. As I drilled down in http://www.nj.com/politics/map/ the election results by city, borough and township, I saw that Christie carried Woodbridge Township by a 51%-42% margin and Edison Township by 49%-45% margin. These are the largest jurisdictions in the county, with about 100,000 people apiece, and Woodbridge was the political base of Jim McGreevey, who was elected governor in 2001 and resigned in 2004 after it was revealed that he had made his male lover head of the state homeland security department. Then I recalled that Middlesex County these days has an unusually large percentage of residents, 18%, who classify themselves to the Census Bureau as Asian. That’s one of the highest figures outside Hawaii and the San Francisco Bay area. And according to these figures from the Census Bureau’s American Community Survey Edison township’s population is 36% “Asian only,” as compared to 49% “white only” and 7% Hispanic, while. Woodbridge township’s population is 19% “Asian only,” as compared to 66% “white only” and 15% Hispanics. The two township’s “black only” percentages are 10% and 9%. In other words, Asians are the largest and most visible minority in Edison and Woodbridge Townships–and are apparently largely of one source, Edison in 2000 had the highest percentage of Indian-ancestry residents, 18%, of any jurisdiction with more than 1,000 Indian-ancestry residents in the nation. Following it on the list were Iselin (part of Woodbridge Township), Plainsboro Township (in southern Middlesex County, adjacent to Princeton), Dayton (a part of South Brunswick Township in Middlesex County) and Avenel (part of Woodbridge Township). What I think we are looking at is an upscale Indian cluster, around the pharmaceutical, scientific and technical firms in central New Jersey. These people appear to be upscale demographically; the Census Bureau’s American Community Survey reports that Middlesex County foreign-born residents (48% of whom are Asian, 26% Hispanic and 6% black) have a higher percentage of over-$75,000 earners than Middlesex County native-born residents, a higher percentage in management and professional occupations, a lower percentage of people in poverty, higher mean earnings, and nearly twice as high a percentage with graduate degrees and more likely to be in married couple families. As one commenter pointed out yesterday, despite getting invited to the Democratic National Convention, Sepia Mutiny was NOT invited to the State Dinner last night. We are human here in the bunker. We hurt and feel slightly slighted. I think I should have have been invited so that I did not have to suffer the indignity of spending hours at Stubhub.com…just hoping in vain. As I alluded to in my post yesterday, an invitation to a state dinner is a big deal. So is not getting an invite. This is especially true if you are widely seen as the current elder statesman of Democratic Indian American Politics. A source tells me that Kumar Barve feels like he got hit by a bus (or thrown under it). I blame Sanjay Gupta for dragging me away from my studies and back to the bunker. Today, when Dr. Gupta posted a picture on Twitter of the sari his wife was wearing to tonight’s state dinner at the White House – I couldn’t help but be drawn into the fashion maelstrom that marked the visit of Prime Minister Manmohan Singh of India and his wife, Gursharan Kaur. (Sorry Abhi, you can have your fancy dinner menu. Give me saris and ball-gowns any day.) But where to start? Ah, Mrs. Obama. Always the fashion darling. She wore not one – but two desi designers today.